Steiff Antonia Teddy Bear Discounts Apply ! Made from the finest quality Caf� au lait Mohair. Looking at Antonia, one almost feels the need to bow respectfully. Immediately it is quite obvious that she is royalty - no doubt a Russian tsarina. 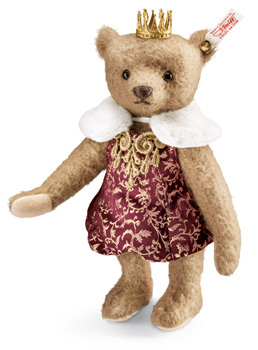 Befitting such a regal personality, Steiff has costumed Antonia in furnishings that are appropriate for a Teddy bear of her status. Antonia is sewn from caf� au lait mohair and wears a wine red balloon dress with a noble gold pattern interwoven throughout. . The dress is trimmed with a white plush collar. At her neck, she wears a stately ornament made of golden thread that has been intricately embroidered. Naturally, her ensemble is completed with a real metal crown perched majestically atop her head. Add an imperial touch to your collection with our Antonia Teddy bear. Jointed, safety eyes and stuffed with synthetic filling material , and with gold-plated "Button in Ear". and Surface Washable. This Bear is part of Steiff's 2013 Exclusive range.